Nainggolan joined Inter from Roma ahead of the new season and he will face Milan for the first time as a Nerazzuri player this weekend, with Luciano Spalletti's men third in the table and four points ahead of the Rossoneri. Although the Belgian claims he has so far not felt the same passion as in the Rome derby against Lazio, he is relishing the opportunity to experience Sunday's clash and secure the bragging rights for Inter. "I believe it is good to prepare for all the matches in the same way, but I'm curious about my first Milan derby," Nainggolan told La Gazzetta dello Sport. "These are the challenges I like, where you already know what you're playing for. "Here, some fans stop me and say, 'Win on Sunday,' but it's all quieter, calmer. In Rome, I had team-mates who were constantly firing me up and, if you lost, they remembered it two months later. "Now Spalletti constantly repeats that the two matches with Milan are in a separate league. I'm sure the roar will be impressive at the stadium." Nainggolan is expecting a tough evening, but beating Milan is not Inter's chief priority this season. "We have many players at the highest level, but I have seen Milan in the last few games and I saw a strong, strong team that will make us sweat," he said. "But do I have to [choose between Milan and the Champions League]? I said to a friend of mine: If I lose the two derbies and, at the end of the season, I'm going to the Champions League and Milan finish fifth, that's alright with me." 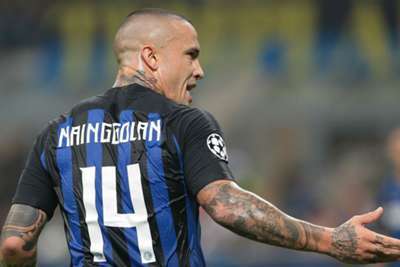 Inter are in a rich vein of form, but Nainggolan wants to see further progress, adding: "Six victories [in a row] have given us confidence, but we still have to improve, to suffer less to win. "Suffering can be beautiful, victories like the one against SPAL mean a lot, but every now and then we need a big win."